Behold! 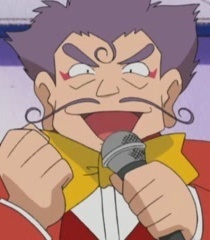 For I am the greatest living mystery of a man in all of Hoenn! They call me... The Trick Master! Wahahaha! Glad to meet you! You, you've come to challenge my Trick House, haven't you? That's why you're here, isn't it? Yes, it is! Consider your challenge accepted! Enter through the scroll there, and let your challenge commence! I shall be waiting at the back!